I have neglected my blog. I like blogging, so what can I say for myself? A demanding job, apathy, depression, a time-out, a boring existence, self-pity, frustration at the lack of control of my life…. Sheesh! You’d think somebody died or something! Get a grip! Change the negative brain recording! I’m shaping up. Mentally, that is. Many of those emotions I’ve listed above apply to a big project. That would be my Aunt Sukey Spins Off project. Yup. I became bored and frustrated with it, and it became a monster sitting on my shoulders and whispering great doses of guilt into my ears. I don’t understand myself. Why…oh why…do I insist on complicating things. I love the acronym, KISS…keep it simple, Stupid. I love it, but have yet to apply it to myself. Here I’ve made this classic traditional red and white quilt. So far, so good. But I can’t decide how to quilt it, and I go all out on the thing. And then I become frustrated. The quilting doesn’t fit the quilt. There are times when I really should take a cue from my good friend Judy Butcher. She knows how to quilt a traditional quilt. I have decided to make one pillow a month. One pillow for each of my grandchildren. I think a pillow with their initial on it would be a fun and personal Christmas gift. Totally doable for me. So, yes, for the first time ever, I’m starting my Christmas list early. Here you see the initial already machine appliqued onto a white background layered with batting and muslin. I drew a squiggly machine quilting guideline with a blue washout marker. Next time, I think I should space that guideline further apart, but it worked out. The squiggly line was quilted first, then the rest of the filler quilting was done. Oops. I missed a small section. I hope the quilt police don’t find it! I made an 18″ pillow and filled it with an 18″ pillow form. I think a bigger form might look better. I like the railroad tracks filler. It is fun and wonky. No rules. Thanks Leah Day! The back of the pillow has a concealed zipper. 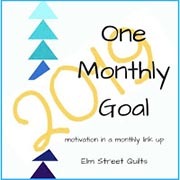 I am linking up with quiltshopgal. 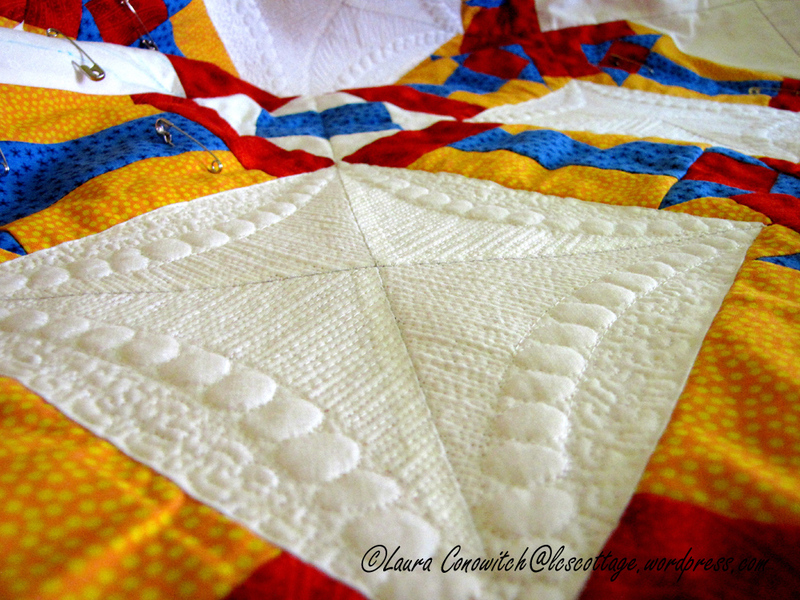 The railroad tracks free motion quilting is from Option #1 from the February Pillow Challenge. I am making progress with Sitting Pretty. The borders are on, and the quilt top is pin-basted. On to the quilting. After June, I think. I am getting my ‘Grandma Fix’. Five grandchildren, 2 daughters, and a son-in-law will be visiting this month. I have the same disease as my blogger friend, Jenny Lyon. It is the “quilt it to death” disease. My saving grace is that I am not a perfectionist. Even so, this project is taking longer than it needed to. It isn’t a show quilt. It isn’t an artsy quilt. A nice edge-to-edge quilting design would have been fine. I am using Aurifil 50 weight in both the top and the bobbin. But not the same color, so I will have ‘pokeys’ (Oh horrors!). As I said, I am not a perfectionist. And it is spring (I wanna be outdoors!). And I have a day job. And I can come up with lots of excuses. But I will finish. This year. More eye candy from the WSQ quilt show! I love Brazilian and silk embroidery! The following photos showcase a stitcher’s wonderful talent that was incorporated into a lovely romantic quilt. 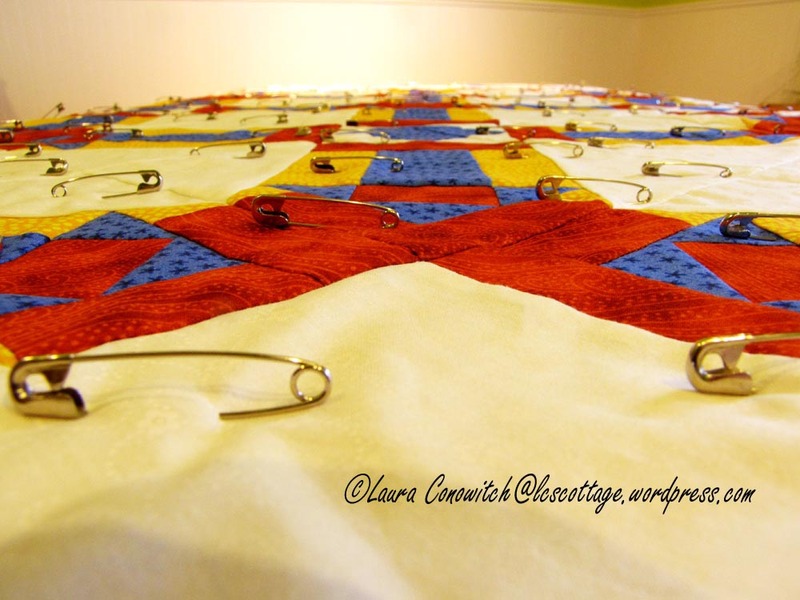 I admire a machine quilter’s confidence when she not only chooses to custom quilt (as opposed to an all over design), but chooses to showcase her (or him) quilting with a thread color that stands out from the background. The next two photos are great examples of this. The next quilter created interest by framing her floral design with a little bit of color in the form of piping. Look closer. There are great touches of embroidery, beadwork, and thread painting. This attention to detail really creates a beautiful work of art. Good things do come in small packages, and this miniature wholecloth is no exception. The quilting is exquisite! The crystals are a great addition to the piece…they don’t overwhelm the design, and add another element of interest. Just look at the teeny, tiny stippling! The next quilt is also a miniature. It is a gorgeous fiber art piece featuring a floral design. The intense color certainly pops and attracts the viewer! I leave you with a closer look that shows the fabulous beadwork in the center of the flower. Love it!